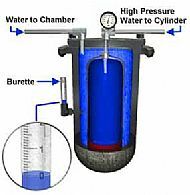 Hydrostatic testing involves filling the cylinder with water and then placed inside a water-filled, high-pressure chamber. The water pressure inside the cylinder is then increased to five thirds of it's maximum working pressure. This causes the cylinder to expand which in turn causes the water outside the cylinder to be forced into a marked collection tube that allows the expansion to be measured. 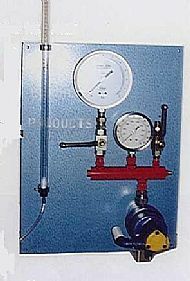 Once the pressure is released the cylinder returns to its normal state. If the dive cylinders expansion is within acceptable limits (<5%), it successfully passes the hydrostatic test. Remember the hydrostatic test period is not affected by the date of the visual inspection. Cylinders require a hydrostatic test every 5 years from the last hydrostatic regardless of the visual inspection date. For example, if you don't use your cylinder for a year or so then have it visually inspected 4 years after it's hydraulic test, the cylinder will only then be in test for a further 12 months before it is due a hydrostatic test.